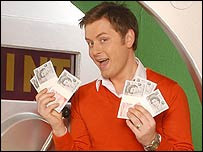 Quiz channel ITV Play has been axed and is to be replaced by a new service, called ITV2+1, on Sky and Freeview. The phone-in channel was suspended last week owing to ongoing concerns about interactive services. Independent auditors Deloitte gave some of its shows a clean bill of health and these will continue to be shown late at night on ITV1 and ITV2. The director of ITV's digital channels, Jonathan Lewis, said the decision to replace ITV Play was "commercial". "ITV2 is a hugely valuable asset in our digital portfolio," he said. "We have taken a commercial decision to increase its impact and reach with a plus one channel." The time-shifted channel will launch on Freeview on 15 March and satellite on 16 March. William van Rest, controller of ITV Play, said: "ITV Play programming has proved most popular on ITV1 and ITV2. "I am delighted that we have been able to return these services following the Deloitte review and that viewers are able to continue to enjoy our shows." Several ITV shows are under scrutiny following a series of allegations that callers were being ripped off. The broadcaster admitted that it had overcharged viewers for red button votes on reality show The X Factor, leading to an investigation by premium phone lines regulator Icstis. The watchdog is also looking into claims that phone-ins were mishandled on Ant and Dec's Saturday Night Takeaway and I'm A Celebrity... Get Me Out Of Here! However, no formal investigation has been launched into these programmes. Channel 4's Richard and Judy and the BBC's Saturday Kitchen are also being investigated by Icstis.